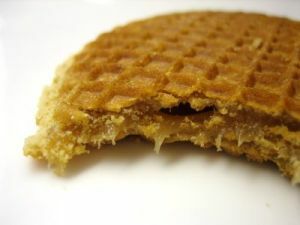 Stroopwafels | Syrup Waffles is a Dutch food recipe for waffles spread with a warm syrup. Mix the yeast in 3 tablespoons water with 1 teaspoon sugar until bubbly. Beat the butter until light, adding the sugar, the salt and the cinnamon. Mix in the yeast mixture, the flour and eggs and knead or beat well. Set it in a warm place for about an hour. Heat the cinnamon, syrup and sugar on stove and cook it slowly until it thickens a bit (about 10 minutes). Remove it from the heat and beat it in butter. It should thicken as it cools, but still be slightly warm and thin enough to spread easily. If it cools too much, reheat it gently; if it thickens too much, add a bit of liquid. Heat the waffle iron and oil lightly. Using a scoop to measure, place the dough in the center of the heated waffle iron and bake it for one minute. Spread the syrup on one waffle surface and then place another on top.